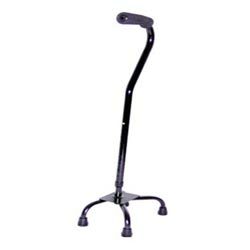 The Quadruped walking stick is strong, yet light in weight, providing support and stability. It is made from lightweight aluminium with a large comfortable plastic handle or a moulded open-ended cuff with a powder coated 4-legged steel base. The Quadruped is height adjustable from the handle to the ground. The Quadruped is adjustable for left-or right-handed use.